Hey Blog Hoppers...It's Christy and Tammy from Fluttering Through First Grade! Summer is right around the corner! But before we hit the beach, we always get asked a lot of questions from parents about summer learning. What can I do to help my child over the summer? How can we keep all this learning intact until school starts again? We're so glad they ask! We like to send our students off with a few summer resources that are easy to understand, quick to complete, and motivating to use. We like to keep it fun because it is summer after all! We all know that one of the easiest ways kids can keep their reading skills fresh all summer long is to read, read, read...and then, read some more! Reading just 20 minutes a day will keep their skills strong and their confidence high. Right? 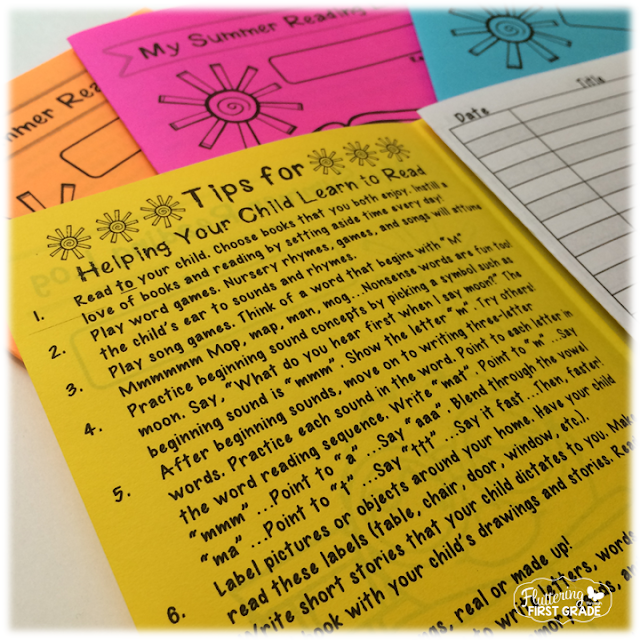 To keep them motivated and reading, we provide our students with these summer reading logs. We've included 2 choices with tips for parents to help them support their reader at home. One is for emerging readers who need phonemic awareness and phonics support and the other is for more fluent readers who are working to strengthen their comprehension skills. Sometimes we send both! We encourage them to work at their own pace, but to please find time each and every day to pick up a book. We even bribe them with a special treat if they bring them back to us at the start of next school year. Whatever works! Students can track their summer reading and keep a list of some of their favorite summer reads. You can download a free copy of our Summer Reading Log. Are you counting down the school days until summer? Stop by our blog to see how we wrap up our school year with a few of our favorite end of school activities!